Food is an essential part of any holiday. Whether you’re a big-time foodie or you just want a break from the cooking, a private chef might be the answer for your Cornish holiday. It’s the ultimate combination of relaxing and treating yourself: a chef serving bespoke food in the comfort of your holiday home. I left St Ives when I was about 18, and I started off doing ski seasons in France, which was a lot of cheffing in chalets and catering for small amounts of people. Then I went on to Canada, Australia and Bali, where I worked and travelled a lot. I did three ski seasons, and it was when I came back to St Ives after all of my travels that I realised that the ski season thing could work on more of a summer term basis as there’s the same sort of ethos. I did a lot of cleaning as well when I was pregnant, so I saw the potential that a lot of the holiday homes had in terms of facilities and the beautiful views. I thought that it just was such a shame that a lot of people were eating out and not utilising their space to have a nice fine dining experience in the comfort of their homes. Following this, and after having my son, I was sort of stressing out as to how I could be a chef and be a parent at the same time, and that’s when I thought about starting the private cheffing business in St Ives. I’m St Ives based – I’m actually local, one hundred percent thorough St Ives girl, as well, and there’s few and far between of us left. What’s your favourite thing about St Ives? What makes you love it? The beaches. I love how small it is, I like the beaches, and I think it’s a really lovely place to raise a family. Of course, the beaches! I know your dad was a fisherman; you must have spent a lot of time by the sea. Yeah, I often came home and the bath was full of crabs, and lobsters, and mum was complaining because his clothes were stinking out the kitchen; I have lots of fond memories of it! I got to dance around the Steeple when I was younger, because you can only do that when you’re a fisherman’s daughter. A couple of times I’ve been digging around in the harbour catching cockles, and I feel lucky being able to do stuff like that, and being able to walk to the end of the harbour and see what fish are about, because it’s not always the same thing. It sounds like you’re really drenched in St Ives, and I imagine your food is as well. Absolutely. I’m just going into my fifth year now of my business, and I started off quite small and let it grow naturally through word of mouth and now I just seem to be getting busier and busier every year. My ethos for the business is to make the best of local and Cornish ingredients. I use all local suppliers, mostly St Ives suppliers. I use the St Ives butcher, and Matthew Stevens [a St Ives based fishmonger], and my dad still has quite a lot of fishing contacts. Often I’ll get a phone call and they’ll be like, oh we’ve got loads this today, or we’ve got loads of that today, and I’ll be like cool, that’ll work out for me. So your food's quite seasonal as well then? Yeah, all the menus are based on the season and what’s good at the time. I have a huge herb garden and lots of edible flowers at home, and I use a veg company called Total Produce and they source a lot of products from Padstow Kitchen Garden. I get a lot of nice salads and organic vegetables and stuff from there. I do try to get as much as I can locally and responsibly sourced. If my clients do want something that’s not in season, of course I can source it, but, you know, it’s not going to be local if it’s not in season, which is fine. How do you decide your menus? People usually email me and ask me for a sample menu, and then we’ll work together, usually over a few weeks, sometimes months if they’ve booked a really long time in advance, until we’ve written a menu that they all like. Quite often I’ll send it to one person, they’ll send it to everyone else and then it might be that we’ll change this and that. The process of actually writing the menu is very important, so there’s a lot of contact between me and my clients before they arrive on their holiday. So the interaction you have with the clients is a big part of it? Yeah, it is quite important, I almost think equally important to the food. You’re coming into someone’s space at the end of the day, and whether it’s their home or a holiday home, it’s their personal space for the week or however long they’re staying, so I think having a friendly character is paramount. I suppose that must be one of the really big differences between being a chef in a hotel or kitchen. Yeah, you’ve gotta have the personal touch as well, definitely. You could go in there and you could cook them the most amazing meal but if when they’re trying to have a chat with you about the food, or asking you whether the wine they’ve got for the evening is going to be paired nicely with the menu that you’ve chosen, you have to be approachable. That’s why the job’s not for everybody. A lot of chefs like the fact that they get to be holed away in the kitchen, but in the past because of being a female chef I’ve done quite a lot of front of house. I always tend to get thrown out there if they’re short of staff, so I can understand both sides of it and I’m happy to do both. The last guests I cooked for I was even shaking up some espresso martinis! Nice! Do you ever have helpers? Do you have other people come in, or do you ever slip the kids of the household a fiver to do the washing up? I wish my son was old enough, but he’s six! Although he does come to help run stalls with me, which he likes doing. No, some clients will ask for a waitress, which comes with a charge, usually £50 for the waitress for the evening, and all that money goes to her. If I do parties over ten, I’ll pay to have someone to help me, which isn’t an additional cost. When it gets to numbers that are ten or more, it’s also easier to give more than one option. If I were you I’d be scared of turning up and seeing a grubby electric stove and thinking, oh no, how am I going to work with this?! You know, it’s not even stuff like that. Quite often you’ll go to a place and you honestly do not know what kind of stuff is going to be there. I do try to get clients to send me a link of the place that they’re staying so I can have a little scope through the pictures and see what I can see in the kitchen, but I do have a lot of my own equipment which I bring along. Sometimes you can go to places and they look like the most well-equipped kitchen, it’s so nice, it’s beautiful, and then you start rummaging around through the utensil drawers and you realise everyday things are missing. I’ve learnt along the way that it’s just best to bring everything of my own, even if I leave it in the car. When I cooked at one venue they didn’t even have a cooker. They had a microwave and a standard half size fridge with a tiny little freezer compartment inside and I was there for ten days. We managed to get hold of a gas barbeque and I had a big paella pan and an electric hob and an electric flat plate. Even if the clients think that they don’t necessarily have the facilities to facilitate a dinner party, it’s always worth getting in touch because I do have a lot of my own equipment which can make it possible, more so than you would think. Let’s talk a bit more about the food. So it’s always really seasonal, and the client is always involved. How does it start? Usually, a client will ask me to send a sample menu to get a rough idea of the style of food I cook, and nine times out of ten they end up picking something off the menu. I usually say to them, okay, does the person whose special occasion it is, do they have any favourite foods? Sometimes people will send it to you straight away and they’ll know exactly what they want and sometimes people have literally no idea and you might have to send a few ideas back and forth. I often ask if there’s a favourite pudding or a particular protein they want, and I’ll work with that and once I get a little bit of feedback I usually send them two or three options, usually of a fish, a meat, and a dessert, and then they’ll have a pick through and we go from there then. So when you work from protein first, how does that work with vegetarians or vegans? I wonder if “veganuary” is affecting your work or whether you’ve not noticed too much. No, just January is affecting my work! There’s not many people here in January. No, I don’t always work protein first, I just try to get a protein, whether it’s fish, meat or whatever and which way round they like it. I recently cooked for some guests, there were 16 of them, and they had a vegan, a meat and a fish course. That was actually really hard work, but they enjoyed it. I love vegetarian food myself, so I’ve got some amazing vegan desserts that I do. Anything is possible, is what I usually say. Is there a favourite thing that you like to cook or does it really vary? There is a favourite thing that everyone always chooses off of my menu, my fillet of beef dish, which I serve in a few different ways. Usually, it’s a fillet of beef which is served whole, and it’s rolled in dried mushrooms and rosemary and then it’s clingfilmed. Some people might call it sous vide, but it’s not sous vide. It’s cooked in the oven at 60 degrees for about an hour, which infuses the flavour, and then it’s seared and it’s sliced and it’s served with celeriac, potato rosti, shallot puree, butter poached carrots, seasonal greens, and a red wine jus. Quite often people go for that one. I’m not surprised, that sounds amazing! And scallops, everyone loves scallops. I also make my own bread, I make all my own ice creams, I make absolutely everything – to some people’s surprise, which I find shocking really. Well, it sounds like a lot of work! I wanted to ask you what you like about being a private chef over being a chef elsewhere. Are there ever times when you think, this would be easier if I could just be in a big kitchen with a team? No! I wish I could just live off the private chef work, but it’s not especially secure. Sometimes you’ll get people booking well in advance, and sometimes you’ll get people phoning up and booking a day or two before, and you have to be like, quick, get a menu together! I’ve even saved the day once when a chef hasn’t turned up for people – they were really pleased when I turned up last minute. I’ve been working in kitchens my whole life, but what I love about the private cheffing over working in kitchens is how much freedom you get to write your own menus and stuff like that. When someone else is pulling the reins, you just really don’t have as much freedom to have your own ethos and have your own respect for food. I can write my menus and my clients know that I will source it all, and the price does reflect that it’s sourced locally. I just love going out and searching for my vegetables. I don’t always buy them and they get delivered, I go to farmer’s markets and I’ll just have a look around, see what’s in season. I love the freedom of it, and being able to have that personal touch with the clients and just being able to be more creative myself – rather than have someone else tell me what I’m going to be cooking, I have to use my own brain. And are you always the cook at home, or do you keep it as a day job? I cook a lot at home. I love barbeques, we do so many barbeques in the summer it’s ridiculous! And I love cooking over a wood fire, that’s something I do a lot at home, and something I can do for clients as well. My partner’s a very good cook as well, he enjoys cooking, so we do it together, and my son loves cooking as well, he likes all the baking side of it, so my kitchen is always full of life! I’m just about to start up this year, alongside the private cheffing, a small wedding catering business. I’ve got a wedding booked in May for 27 people, and I think to do petite weddings might be a really nice thing. So that’s my next little project, which I’m sorting out a website for at the moment. It’s as Cornish as a wedding can be, you’re in Cornwall and everything you’re eating is Cornish, and I think that’s a very big part of it for people who want to get married in Cornwall. There’s a reason why they chose to get married here – it’s not just the beauty, it’s the beauty of what’s available as well. I don’t want to go too big with the private cheffing – I like the idea of being a small niche project. I like the fact that I’ve never over advertised myself – every phone call, every email, every single job I’ve had has been via recommendation. Well, you’ve definitely got our recommendation! To get hold of Natasha for your holiday (and to view all her outstanding reviews), contact her on her Facebook page, Natasha Private Chef Hire. 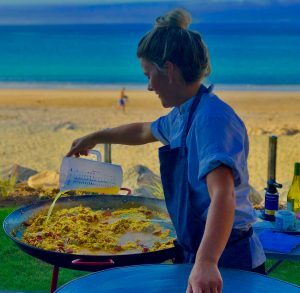 She’ll also be cooking for the Wild Wine Club at The Great Estate Festival; for a sneak preview of her work, catch her whipping up a Portuguese-flavoured storm in May 2019. Once again it was time to celebrate the biggest and most eagerly anticipated day in the town’s calendar, Helston Flora Day.